I want to preface this post by saying I am a huge advocate of exercise, preferably outside if weather conditions allow. I believe there are physical and psychological benefits to being active, and I even ‘walk the talk’: although I do not run any more, I am a notorious walker and swim regularly. I also do a quick resistance-based exercise regime at home (or in a hotel room, say) most days. But while I strongly advocate activity and exercise, I have more than once written about the limited role that exercise, as is commonly advised, has in weight control. Those seeking to attain or maintain a healthy weight are often advised to walk, jog or cycle regularly. The idea here is that burning extra calories through exercise will assist weight loss, and the theory certainly seems to make sense. The problem is, when researchers have studied the impact of regular exercise on weight loss, the results have been pretty dismal. When added to dietary change over the medium term (e.g. few months), regular exercise boosts weight loss by about 2 lbs on average. In other words, if someone were to lose 20 lbs over 4 months through dietary change, adding regular aerobic exercise to this would, generally speaking, lead to a loss of 22 lbs. (Remember, though, there are other benefits to be had from exercise). The idea that activities such as running and cycling (aerobic exercise) are not particularly effective for weight loss is counter-intuitive. Some people imagine that individuals must be losing fat and gaining muscle. But aerobic activity will build minimal muscle, if any at all. So, what rational explanations exist for the observation that aerobic exercise does not translate into significant weight loss for many? Well, the first thing is that exercise does not burn much in the way of calories unless we’re doing it in very significant quantities. Let’s say you jog for half an hour and burn about 200 calories more than you would have burned sitting down. That’s obviously better than nothing, but this is not a ton of calories, and as there are about 3,500 calories in a pound of fat, theoretically you’d have to do 17 or 18 of those half-hour runs before you’d lose a pound of fat from your body. That, for many, would not seem like a particularly worthwhile return on investment. But another problem with exercise is its tendency to stimulate the appetite. And even if it does not do that, some may ‘reward’ themselves with food or drink (e.g. alcohol) after exercise. And it doesn’t usually take too many additional calories to undo the calorie deficit induced by exercise. I’ve written about these factors before, and write about them again here as a prelude to writing about something I learned when I was on the ‘low-carb cruise’ in May. One of the other speakers on the programme was diet and exercise researcher Dr Jeff Volek from the Neag School of Education at the University of Connecticut. Jeff’s presentation on the cruise included details on how a low-carbohydrate diet can stimulate fat-burning during exercise (more about that in another post, perhaps). During his presentation, he remarked that (as we know), exercise is not a very powerful weight loss tool. However, he went on to talk about a mechanisms here that came as quite a surprise to the audience, I think: aerobic exercise can suppress the metabolic rate. We’re often told that exercise not only increases calorie burn while we’re exercising, and also for some time after. It turns out, that may well not be the case for many people. In fact, according to research, the opposite is quite likely to be the case. The idea that the body would down-regulate the metabolism in response to exercise makes, I think, intuitive sense. We know, for example, that when people consciously cut calories to lose weight, it very often puts a sizeable dent in the metabolism. This is probably part of a survival mechanism (the body doesn’t know we’re not going to starve ourselves to death, and will put into play mechanisms which help the body preserve its weight and fat stores). It’s not too difficult to imagine that the body would have a similar response to increased calorie expenditure (through exercise). None of this should put you off taking exercise if that’s what you like to do and are physically able. However, these observations may go some way to explain why all the effort you may be putting in pounding the streets or exercising on a treadmill or cross-trainer are not causing the pounds to melt away. My experience tells me that most bang for the buck for weight loss is had by getting the diet right. For me, that means a diet based on real food that it generally higher in fat and lower in carbohydrate than the diet we are traditionally advised to eat. 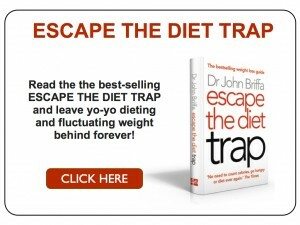 The scientific rationale for such a diet is explained in my book Escape the Diet Trap. 1. Bouchard C, et al. The response to exercise with constant energy intake in identical twins. Obes Res 1994, 2(5):400-410. 2. Heymsfield SB, et al. Rate of weight loss during underfeeding: relation to level of physical activity. Metabolism 1989, 38(3):215-223. 3. Phinney SD, et al. Effects of aerobic exercise on energy expenditure and nitrogen balance during very low calorie dieting. Metabolism 1988, 37(8):758-765. 4. Woo R, et al. Voluntary food intake during prolonged exercise in obese women. Am J Clin Nutr 1982, 36(3):478-484. 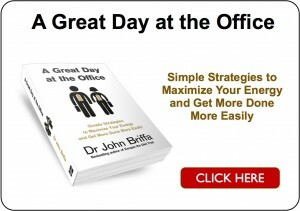 Excellent commentary as usual, Dr. Briffa! You never know which camp you are in — those that respond positively to exercise or those that the additional stress causes the body to shut down in prep for further load or torture. That’s one of the reasons I recommend to those starting Atkins to take the month off if possible and get the eating right first. That way they can know the impact of starting the plan, and this is coming from a guy who runs 15-20 mile training runs and marathons on the weekends. I completely agree. I have trained for and run a marathon whilst continuing to eat as normal, but with markedly increased levels of aerobic exercise and my weight has stayed exactly the same. If I made adjustments to how I eat, then the weight starts to come off. I am interested in the latest research suggesting short burts of high intensity aerobic and resistance exercise seems to have a beneficial effect on blood glucose control and lipid metabolism. Any view on this? Great post! Fits in well right now as I Just happen to be reading “Art and Science” I struggled for years in the military on a SAD and drinking, to maintain my weight. Now years later and having dropped grains, and become more of a paleo style eater I have dropped 40 lbs and kept it off over a year and exercise less! Doing just HITT and body weight exercises 1-3 times a week. I am 55, 215, and feeling great! Still want to drop 10-15 but taking my time now. Thanks David – well spotted and corrected now. If it were a pill, people would pay good money for something that gave them an extra 2lb weight loss! A dose–response relation between aerobic exercise and visceral fat reduction: systematic review of clinical trials, K Ohkawara, S Tanaka, M Miyachi, K Ishikawa-Takata and I Tabata, International Journal of Obesity 2007. If the results in this paper are correct, we may not loose weight as a result of our exercise – but we do loose visceral fat – the very stuff we need to loose for health. As a gym owner since 1981, keen HIT’er, franchisor of women’s weight loss and exercise centres that combine diet, diet coaching and exercise that’s helped over 8,000 women lose over 130,000 kilos, I have come to accept that weight loss and control is all about diet. Exercise, and especially resistance exercise have a large range of wellness and aesthetic benefits – whether that includes weight control is a question. It would be good to see a critical analysis of the Weight Control Registry http://www.nwcr.ws/Research/default.htm that suggests that its an hour a day of exercise that helps weight control. It would also be good to see the fitness industry stop promoting weight loss and start promoting wellness and even social benefits. (I’ve had many members marry!) Many also enjoy group exercise activities – tribal dance or sports team effect. I’m off to do some push ups and cook some eggs. swim time to 30 mins. Am 67 and female! I need swim days off for 2lbs on to be 2 off again! I’ve been thinking a lot about this… As Dr Briffa very clearly states – exercise is good for a number of reasons, but maybe not for weight loss. At least as a stand alone activity. I exercise regulary, sometimes more intense – and always after my more intense training sessions (can be heavy weight lifting or a longer run), I get hungrier… and eat more, and maintain my average weight. I should say that I don’t have any weight issues to deal with. When I talk to people about diet, training, weight loss etc I always recommend to start some sort of physical activity – I’ve noticed that even though you might get a little hungrier, it’s easier to avoid putting some crappy food in your mouth after you actually have done something positive for your body, like a 30 minutes walk after dinner. Why do most doctors, dietitians, and sports scientists think the opposite? “Because the smarter and more educated people think they are, the more vulnerable they are to simple thinking errors. Although we assume that intelligence is a buffer against bias, it can actually be a subtle curse. Here’s a simple arithmetic question: A bat and ball cost a dollar and ten cents. The bat costs a dollar more than the ball. How much does the ball cost? When people face an uncertain situation, they don’t carefully evaluate the information or look up relevant statistics. Instead, their decisions depend on a long list of mental shortcuts, which often lead them to make foolish decisions. These shortcuts aren’t a faster way of doing the math, they’re a way of skipping the math altogether. Asked about the bat and the ball, we forget our arithmetic lessons and instead default to the answer that requires the least mental effort. Interesting piece. I am fascinated by the ward studies and will look into them as I’m interested in the type of exercise, caloric situation (hyper/iso/hyper) and other confounders. I should note that a 2008 AJCN study (Ohkawara) – also a metabolic ward study did not show a metabolism suppressing effect (a slight increase – not statistically significant). That said, I would have to say that in terms of efficacy of exercise and fat loss at the very least it depends on the FITT principle (frequency, intensity, type, time). The trump card with exercise is the afterburn affect – particularly with resistance and metabolic conditioning type exercises – which does tend to increase REE (statistically significantly). Further, the NEAT factor plays an important role as well – moreso than intentional exercise in many cases. I have to contend your “eating makes you hungry” opinion. Although there are people who are “compensators” the vast majority of research shows this not to be true and in fact has more of an opposite effect. Taubes cherry-picked his way through this one in GC,BC. There is a very sound review (Blundell, 2003) worth checking out. In any case, I agree that exercise isn’t a substantial player, per se in most cases – bowing to dietary change. I am skeptical, however of those who swing the pendulum too far in the other direction by claiming it’s counterproductive. These are the very populations urged to eat less and move more to lose weight and improve health, yet this study specifically excludes them in the conclusion of the study. So, only the headline of the study contradicts Volek’s discussion, but that contradiction disappears with careful reading of the study abstract. The U.S.-based NWCR is based entirely on annual food recall questionnaires — responses by registry members about what they say they remember they ate over the past year. This methodology is notoriously unreliable, regardless of the detail in the questionnaires. It’s a pity that no prominent academic is calling shenanigans on this registry’s methodology, given the credibility it has in the public mind. Just want to add that endurance exercise is known to increase mitochondrial leaking. That’s why I think resistance training and interval training are far healthier. The same could be same for diet, if it is not changed in significant quantities. If an overweight person only cuts out one doughnut a week they should not expect to see any result. One of the great dividends of having spent some time with you on the Low-Carb Cruise is that I can read your posts and hear your voice! Your take on the exercise issue precisely mirrors mine: Weight is largely about diet, not primarily exercise, though exercise does exert its own unique set of benefits. I find that males, in particular, will often indulge in diet while trying to compensate in exercise and, of course, it only serves to booby trap their effort. We should talk sometime soon! Thanks for your comment – could you explain a little more about mitochondrial leakage? Yes, you’re right, of course. But here’s the thing: I’ve seen time an again how individuals can easily shave several hundred calories off their daily intake just be eating right (i.e. without hunger), while increasing energy expenditure by a similar amount would be unrealistic and unsustainable for most people. That’s the difference. Really enjoyed meeting you on the cruise and yes, we should indeed talk some time! When mitochondria produce energy with oxygen, free radicals are produced. Glutathione will neutralize these within the mitochondria up to some level. In endurance exercise you will exhaust your glutathione and the mitochondria release the free radicals in the cytoplasma. There the ROS damage starts in DNA and cellwall. This is the general theory of aging. Burning glucose makes it all worse as you need more oxygen per unit of phosphate compared to fat. Pauzing your exercise – as in interval training – allows for restoration of the glutathione levels. Eating a lot of satured fat makes the cell wall less vulnerable to oxidation. Sadly, most people believe that eating lots of carbs, avoiding saturated fat and jogging keeps you fit. In reality they are exhausting their stemcells (as destroyed mitochondria need to be replaced) and speed up their aging in general. Not good! Professional athletes are not famous for living long lives. It appears marathon runners have a higher than average chance to attract cancer. Of course, it’s all dose dependent. But why take the risk? Very interesting and appreciate you taking the time to post this. One more thing I think is relevant here. When in ketosis, the ketones stimulate glutathione production. You can veriify this on pubmed if you like. So eating paleo/keto/low carb is a double edged sword; having more glutathione reduces mitochondrial leaking and the right fat in the diet makes the cellwall more robust against ROS attack.